UV radiation has been known for a long time to be a risk factor for the development of skin cancer. Simultaneous infection with human papillomaviruses (HPV) has also been suspected to promote skin cancer, particularly in organ transplant recipients. Scientists from the German Cancer Research Center (DKFZ) have now been able to show for the first time in a natural system that papillomaviruses associated with UV light promote the development of non-melanoma skin cancer. The investigators provide an explanation why the viruses can be detected in benign human cancer precursors but not in advanced carcinoma. Everyone is infected with skin-typical (“cutaneous”) human papillomaviruses (HPV) at some point in their lives, usually in early childhood already. In healthy people, the immune system can fight off the viruses, but this often changes in older age. Recipients of organ transplants whose immune system is suppressed by long-term drug therapy to prevent transplant rejection are particularly at risk. These patients’ risk of developing non-melanoma skin cancer is up to 250 times higher than normal. Case numbers of non-melanoma skin cancer continue to rise. Ultraviolet radiation exposure is generally known to be a major risk factor for skin cancer. Non-melanoma skin cancer in fact occurs primarily on sun-exposed sites of the body. In addition, researchers have suspected for some time that certain types of human papillomaviruses (HPV) additionally play a role in cancer development. However, clues to prove this have been insufficient to date. Researchers led by Frank Rösl at the German Cancer Research Center (Deutsches Krebsforschungszentrum, DKFZ) in Heidelberg have now been able to provide this evidence. They used a specific species of mice that usually contracts infection with papillomaviruses shortly after birth, like humans. Rösl’s team compared the virus-infected animals with control animals that were raised in a completely virus-free environment. They exposed the animals to UV radiation at a dose that could be expected during a vacation in Mediterranean regions. Subsequently, only virus-infected animals developed non-melanoma skin cancer (squamous cell carcinoma) while the virus-free control animals did not. The investigators noticed at first glance that a group of tumors was keratinizing while the other one was not. The keratinizing tumors contained large amounts of viruses – a situation that is also found in precursors of cancer (so-called “actinic keratosis”) in humans. This is a condition where cells of the upper skin layers have started to grow excessively while still resembling the original structure of the skin. The researchers demonstrated that the viruses affect the stability of the host cell’s DNA, thus promoting the accumulation of UV-related damage. By contrast, the second group of tumors did not contain any viruses. This is also the case in patients with advanced carcinoma. However, tests for antibodies in the animals’ blood revealed prior infection with the virus. These tumors exhibited a striking rate of mutations in a gene called p53, which is crucially important for the cell and is regarded the “guardian of the genome”. This gene is also defective in many cases of human squamous cell carcinoma, leading to uncontrolled cellular growth. 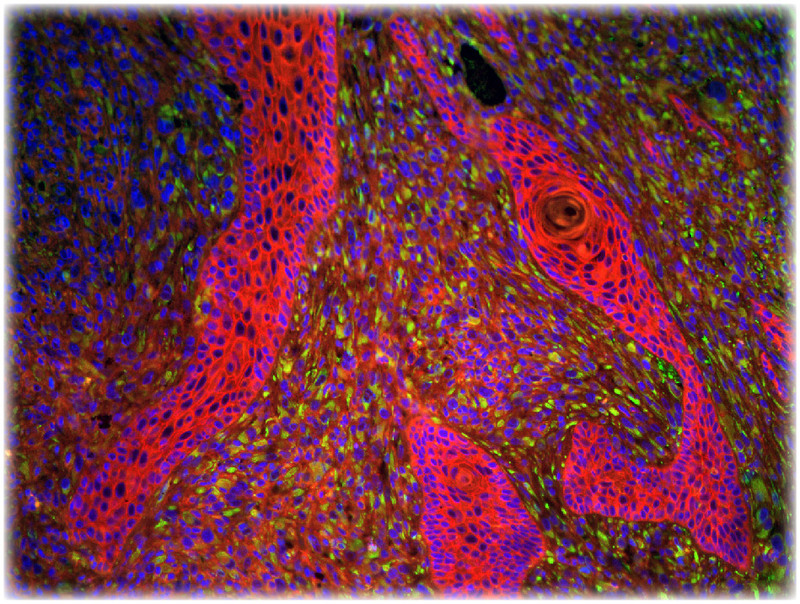 Picture Caption: Squamous cell carcinoma; (red: E-Cadherin; green: Vimentin, blue: cell nuclei). Use is free of charge. The German Cancer Research Center (Deutsches Krebsforschungszentrum, DKFZ) permits one-time use in the context of reporting about the topic covered in the press release. Images have to be cited as follows: “Source: Hasche et al., PLOS Pathogen, DOI: 10.1371/journal.ppat.1006723”.